Yesterday I went to the clinic and got some medicine to make me lose weight. The doctor said that all I need to lose is 38lbs. I stopped by Hopies house after the doctors visit. Hope and I had a great time. We talked, laughed and drank coffee. This was speacial coffee though, well, the coffee wasn't speacial, just regular coffee. The cup was whatwas so speacial. It actually said coffee, but that is not all, it also said cocoa and sweet!!!! I felt like a princess since the woman at the dollar store wanted to sell me the cup that said JUST coffee for 15 bucks! I told Hope that I wonder how much she would try to sell me this rare cup for! Below is me with the coffee cup! By the way I do want some they match my kitchen to a T! Daniel also fixed my mommy ride yesterday! I have an awesome van that I missed so bad while it was broken so today I went and got tags for it. It was so cool! I loved being back in my mommy van. Tommorrow I have to take my little boy, Kirkland, to the ER. We don't have any insurance right now and last Saterday he hurt his leg somehow. He had ball practice that morning and then he had a friend come spend the night with him. While they were outside playing, his friend hit a rock with a stick which broke and flew up and hit him in the knee. His leg is swollen from his knee down and his knee is blue. I do not know what is wrong with it. Nothing I have given him seems to help. Hopefully we will find out what is wrong with it, it seems like if it were a pulled muscle, it would be better by now. At least a little bit anyway and the swelling should have went down quiet a bit. I will let you guys know what the doctor says. Please pray for him. We would really really appriciate it! I love you all and I thank you for your posts and letting me be a part of your lives. You mean a lot to me! I also recieved two awards from Karen H. They are so cute!! I love them both! Thank you Karen! The royal banana is the first one! 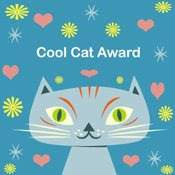 and this one is the cool cat award! I know that most of you are friends of Karen's but if you are not, then please take these with you as well. Well it is time for bed, we have a big day ahead of us tomorrow, blah! Hey, I'm glad you're taking Kirk to the doc. You never know with kids. My friend's son hit his hand on a locker and it was all swollen. The doctor xrayed it and he had broke his growth plate which I didn't know kids had!! Tell him I love him and praying that it's nothing serious. Oh yeah, I forgot to say Congrats on your awards!! I finally got mine on a page of their own and even figured out how to do a link button. Took me over an hour!! Congrats on your awards sweetie. I will be praying for Kirk. Take care, happy valentines day. Happy Valentines Day to you and your family. I hope your son gets well and his knees will soon heal. "By the stripes of Jesus your son is healed." You surely had a very busy day. Congratulations on your twin awards. You deserved both of them. Thanks for the post. God bless you all. I'm so glad you liked the Awards. You are most deserving of them. I can't believe you and Hope had coffee without me. LOL. Sure wish I could join yall sometime for coffee. I do love the coffee cup you are holding. I can't believe they sell one at the Dollar Store for $15.00. I thought the Dollar Store was suppose to be cheap? I will be saying prayers for Kirk. He may have a broken bone. Once, our youngest daughter was at a sleep over and she fell off of a bunk bed on top. She came home the next day and was running fever and I gave her Tylenol. Her arm was never swollen, but she favored it you could tell by the way she held it. That happened on a Friday night. That Monday, I took her to the ER and it was broken. She had to have a temporary cast put on it and then I had to take her to a bone doctor a few days later and he put a Pink cast on it for her. Pink is her favorite Color. I'm glad your hubby got your Mommy Van fixed. Now, all we need is to see a picture of it. Take care my friend and have a great day. May God Bless You and Yours.